If there's one market where all-out capability still rules the day, it's heavy-duty pickup trucks. 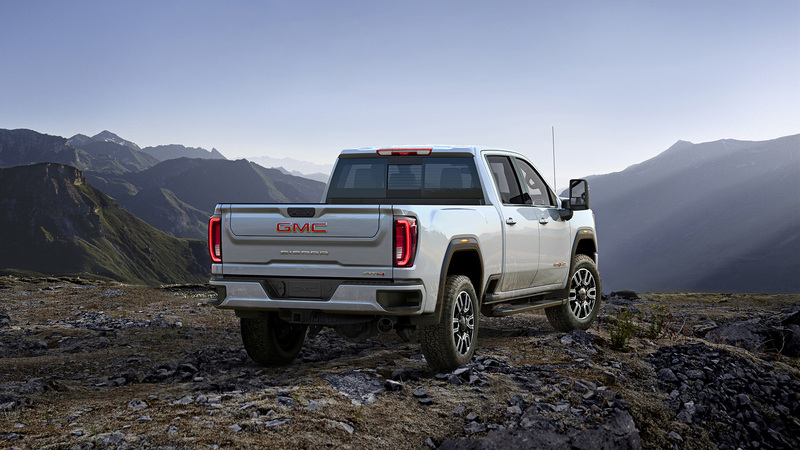 To that end, and with the Great Truck Wars hotter than ever, General Motors pulled out the big guns in San Diego on Tuesday by staging a surprise reveal for the next-generation 2020 GMC Sierra HD. Tons of trailering tech, a 10-speed transmission, and a classic face that eschews the Silverado's controversial redesign—this is GM's new haute hauler. 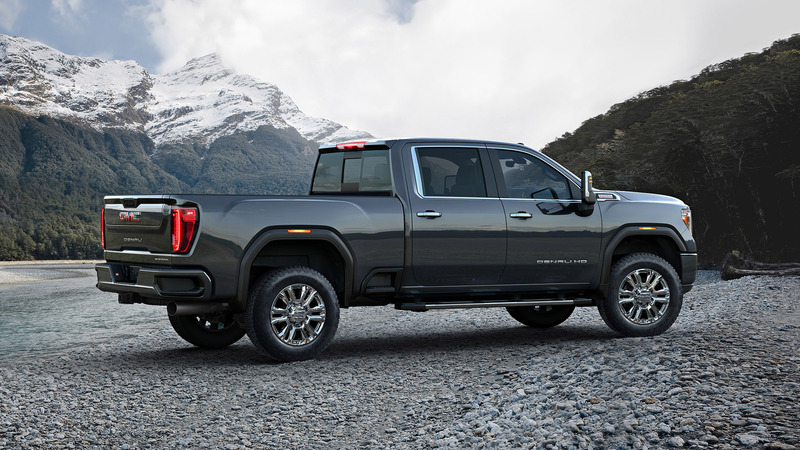 While the Chevrolet Silverado HD's polarizing look spawned a thousand hot takes, the 2020 GMC Sierra HD is more like a soothing balm of classic cool. Even in the top-tier Denali trim, it swaps the Silverado's oddly-pinched maw for one dominated by straight lines, chrome accents, and a solid, no-nonsense aura that feels neither faked nor forced. The GMC Sierra is often described as the "boss's truck," but no heavy duty version has captured that essence quite like this. Longer and taller than the outgoing model, it's a handsome rig, vying with the new Ram HD as the best looking of this new crop of working pickups. Visuals aside, the new Sierra HD makes a compelling case for itself with the segment's most comprehensive suite of towing technology. The so-called ProGrade Trailering System, also available in the regular duty Sierra 1500 (a less-thorough setup is found in the Silverado), delivers 15 available camera angles with which to admire your terrible parking job, including one that allows you to "see through" the trailer. Other shots give you every conceivable viewpoint you'd want of the action, including inside the trailer if you hook up a compatible unit with an indoor security camera and need to double check that that pothole didn't dislodge your camper's TV. Then there's the ability to remotely monitor your trailer's mechanical condition or even turn on its accessory systems (think heat or A/C for a camper) en route to your destination. The 15-inch heads-up display also shows an inclinometer to keep track of road grades. 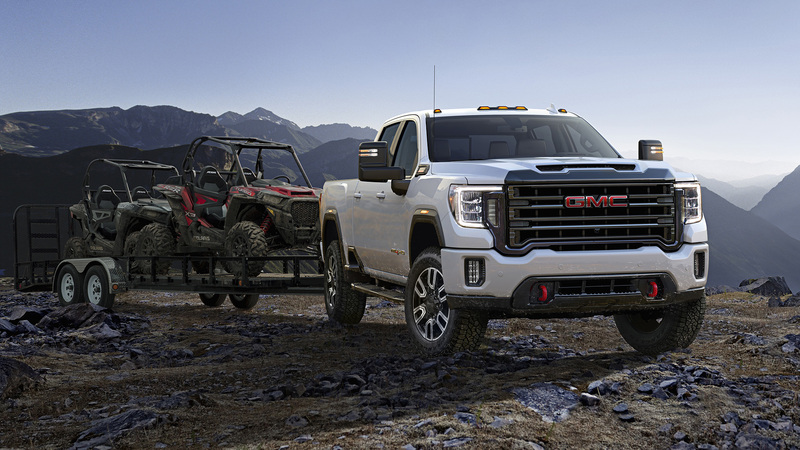 Befitting a vehicle whose primary purpose in life is to haul, tow, and push large objects around, the 2020 Sierra HD will offer the usual 6.6-liter Duramax turbodiesel V-8 with some key cooling improvements. Its 445 horsepower and 910 pound-feet of torque are unchanged, but the new class-exclusive Allison 10-speed automatic transmission can take full advantage of all that grunt by surfing the torque peak. What does that mean for towing? Specific numbers haven't been released yet, but GMC promises "well in excess" of 30,000 pounds at the max. That should put it within striking distance of the Ram HD and its monstrous 35,100-pound towing capacity, even if the Sierra HD doesn't quite match the Ram's 1,000 lb-ft of torque (again, we're talking diesel-equipped duallies here). Another direct shot at FCA is the planned Sierra AT4 HD, an off-road trim that packs a suspension lift, Rancho shocks, skid plates, a locking rear differential, and unique interior accents to combat the Ram Power Wagon. The AT4 moniker doesn't carry quite the same cache—but you won't here us complaining about another off-road-capable pickup, especially since Chevrolet likely won't be making a Silverado Trail Boss HD. In case you've missed all the commercials, GMC is pretty proud of its trick MultiPro tailgate that can be opened six ways to Sunday. 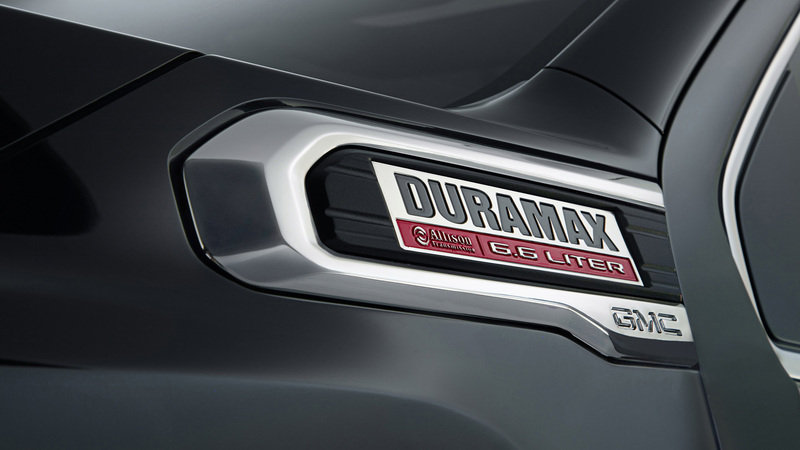 For the 2020 Sierra HD, the admittedly-clever piece of kit will be standard on SLT trucks and above and optional on lower trims. 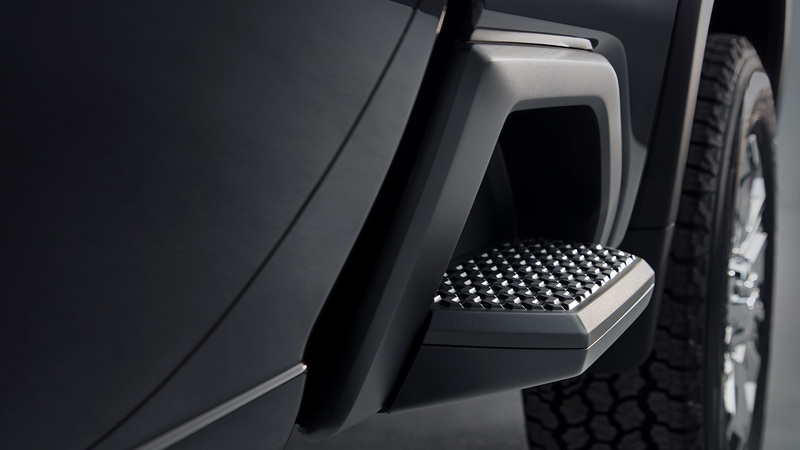 More important to daily users might be the one-inch-lower bed floor that makes load-in and fifth-wheel hitching just a little easier and standard side steps in front of the rear wheels to improve bed access all around. 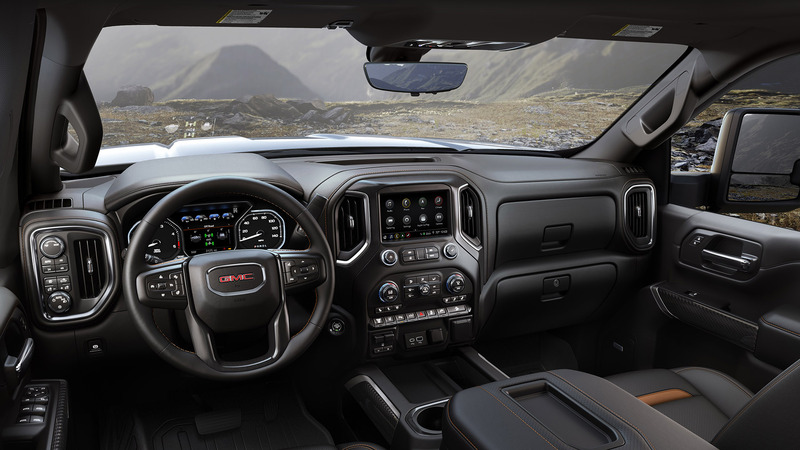 The interior looks much like the Silverado—which is to say, not as nice as the new Ram. Still, it does promise best-in-class head and legroom. The full-size pickup truck segment, in particular its heavy duty subset, trades on loyalty above all else. It's next-to-impossible to get a Ford guy in a Chevy, a Ram gal in a GMC, et cetera. 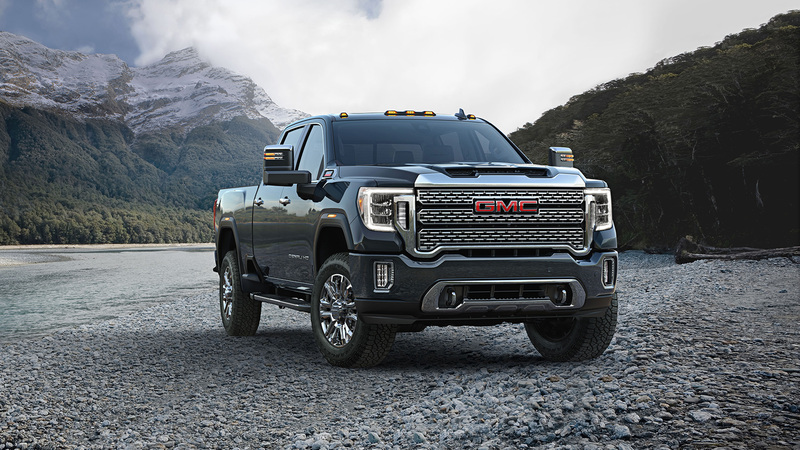 But with a new generation comes the chance to make a true mark in people's minds, and with a smart look and smarter towing tech, the 2020 GMC Sierra HD is well-positioned to win at least a few battles. Pricing and full specifications will be released before the truck hits dealer lots later this year.